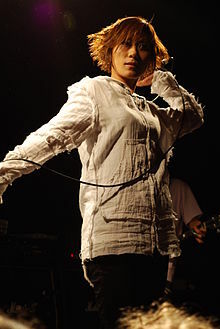 Melt-Banana is a Japanese noise rock band that is known for playing extremely fast grindcore and noise music mixed with experimental, electronica and pop-based song structures. Since forming in 1992 the band has released ten albums and toured worldwide extensively. In 1991, while attending Tokyo University of Foreign Studies, Yasuko Onuki started a band called Mizu and, after a short period rehearsing with another guitarist, recruited Ichirou Agata to play guitar in the band. Mizu's original drummer and bass player quit six months after Agata joined, leaving Yasuko to handle the bass and vocal duties until she found bassist Rika. They briefly performed shows around Tokyo without a drummer. Sudoh Toshiaki then joined as the new drummer in November 1992, and they changed their name to Melt-Banana. In May 1993, Melt-Banana played a show opening for KK Null of Zeni Geva fame, who was impressed enough to immediately offer them a deal with his label, and would later introduce them to Mark Fischer of Skin Graft Records and Steve Albini. In 1996, sick Zip Everywhere was nominated for MTV UK's best video. In the same year the band completed their first European tour. In 1997, they created their own recording company, A-Zap (formerly Iguana Coax), and re-issued most of their early albums. Around this time, drummer Sudoh Toshiaki quit. Oshima Watchman became the new official drummer in February 1998. The band's first Peel Session was in September 1999. Peel described the session as "Simply one of the most extraordinary performances I have ever seen and ever heard ... just mesmerizing, absolutely astonishing." Watchman left the band in 2000, since then the band has had different drummers helping them on tours and in making albums. In 2007 Melt-Banana recorded the song Hair-Cat (Cause the Wolf Is a Cat!) for Perfect Hair Forever on Cartoon Network's Adult Swim lineup. The studio album Fetch, released September 2013, saw the band transition to a duo. The decision not to use a live drummer led on to the decision not to have a live bass player. Using a computer for the rhythm allowed more freedom in arrangement. Hamamoto's help was not needed for the new duo format. Additionally, throughout the band's career Agata and Yakuso had been the main songwriters. Melt-Banana's music falls under what many call "noise rock." Agata plays highly unorthodox guitar with extended techniques. For instance, he overlaps two different guitar riffs, simulates lasers and sirens, and has an impressive arsenal of effects, almost all made through his guitar and large amount of effects pedals. Yasuko O. belts out high-pitched screams and raps very quickly. Rika Hamamoto's bass lines are not subdued like in most bands, but are foregrounded as much as Agata's guitar work. The sounds from the bass provide a distinct dimension to the music not found in many other bands. The drums are usually quite straightforward (however, in their recent albums, they have become more complex), especially on the faster songs, where they beat almost straight through with set cymbal crashes, adding a large amount of energy to the songs. The band describes their recent music (especially Teeny Shiny and Cell-Scape) as pop, but it is far from it, except more accessible when compared to their earlier albums, perhaps. [original research?] Essentially, it could be argued that Melt Banana's output, (with special attention brought to their more recent songs) is more reminiscent of quirkier indie pop bands, with definite melodies hiding beneath the distortion, effects and sheer speed. [original research?] Yasuko even sings, as opposed to barking, parts of the track "If It Is the Deep Sea, I Can See You There" on their album Cell Scape. Also of note, most of their albums are intentionally lo-fi, as that is Agata's feeling for the music; however, group members disliked how these recordings sounded on the radio, so they aimed to make their last two albums more hi-fi. From 2013 onward the band does not have a bass player. Melt-Banana does not currently have an official drummer. From 2013 onward the band does not have a drummer when playing live. There have been two drummers who were official members; Sudoh Toshiaki and Oshima Watchma. A number of guest drummers have been used for studio recordings and live performances. Sudoh Toshiaki (Machine and the Synergetic Nuts) (1992 to December 1997). Appears on Speak Squeak Creak, Cactuses Come in Flocks, and Scratch or Stitch. Kikuchi (ex-Assfort) – guest live drummer, one show, early 1998. Youichiro Natsume (ex-Multiplex, ex-Force) – guest studio drummer, early 1998. Appears on Charlie. Oshima Watchma (Coaltar of the Deepers, ex-Satanic Hell Slaughter) (February 1998 to 2000). Toured, and appears on MxBx 1998/13,000 Miles at Light Velocity and Teeny Shiny. Dave Witte (Municipal Waste, ex-Discordance Axis) – guest touring drummer, US and Europe only, 2001 to 2005. Obokata – guest live drummer, Japan only. Masashi Sakata (324) – guest live drummer, Japan and ATP UK 2002. Takiya Terada – guest live drummer in 2002, 2010–2012. Eiji Uki (ex-Acid Mothers Temple, ex-Monghang) – Guest live drummer, Japan and 2007 US tours and 2008 Europe tour. Yasuhiro Inomata – guest live drummer in 2009. Melt-Banana have released eleven full-length albums and 23 EPs (primarily split releases with other bands, most of which were compiled onto one disc in 2005). Melt-Banana is known for covering an eclectic selection of songs. "Heart of Glass" (Blondie) – live (2007). There were two different versions performed, one faster and upbeat, the other significantly slower. "Monkey Man" (Toots & the Maytals) – studio – split 7"
"Paint It, Black" (The Rolling Stones) – live and allegedly recorded but not used for a compilation. "Surfin' U.S.A."/"You're Welcome" (The Beach Boys) – studio – MxBx 1998/13,000 Miles at Light Velocity. "Surfin' U.S.A." has also been played live, often with an intro of Lenny Kravitz's "Are You Gonna Go My Way"
"Tintarella di Luna" (Mina) – studio – split 7"
"Uncontrollable Urge" (Devo) – live (2005). A studio version was released on a split CD. "White Christmas" (Bing Crosby) – studio – The Christmas Album compilation. The song "Here Comes Santa Claus" on the same CD is often attributed to Melt-Banana, but is actually performed by (Seagull Screaming Kiss Her Kiss Her), a somewhat similar band from Japan. ^ a b c d MELT-BANANA Band Page. Skingraftrecords.com. Retrieved on 2011-09-19. ^ JaME U.S.A. – Jpop, Jrock, Visual kei, all about Jmusic (Japanese music)! | JaME U.S.A. Jame-world.com. Retrieved on 2011-09-19. ^ blood sisters: women in heavy music: melt-banana. Kzsu.stanford.edu. Retrieved on 2011-09-19. ^ Melt-Banana@Everything2.com. Everything2.com (2000-05-08). Retrieved on 2011-09-19. ^ Melt Banana with Mr. Bungle concert review. Ram.org (1995-11-29). Retrieved on 2011-09-19. ^ Melvins Tour Dates 1999 – MelvinsWiki. Themelvins.net. Retrieved on 2011-09-19. ^ Melt-Banana prepares for massive tour, supporting Tool in Arenas, Drawer B. Drawerb.com. Retrieved on 2011-09-19. ^ "Melvins, Napalm Death & Melt-Banana announce 2016 tour". Brooklyn Vegan. BrooklynVegan.com. Retrieved 7 December 2015.